MT4 vs cTrader: Which Forex Trading Platform is Better? Home › Blog › MT4 vs cTrader: Which Forex Trading Platform is Better? Today’s advanced technology has enabled the creation of many new trading platforms, allowing users to execute trades, evaluate markets, copy portfolios of more experienced traders, and much more. How popular a broker’s platform becomes will depend on its usability and functionality. Drawing comparisons between the trading features available on the platforms will allow a trader to evaluate which one is the most suitable for their needs. This article will discuss the similarities and differences between the most popular Forex trading platform, MT4, and cTrader. 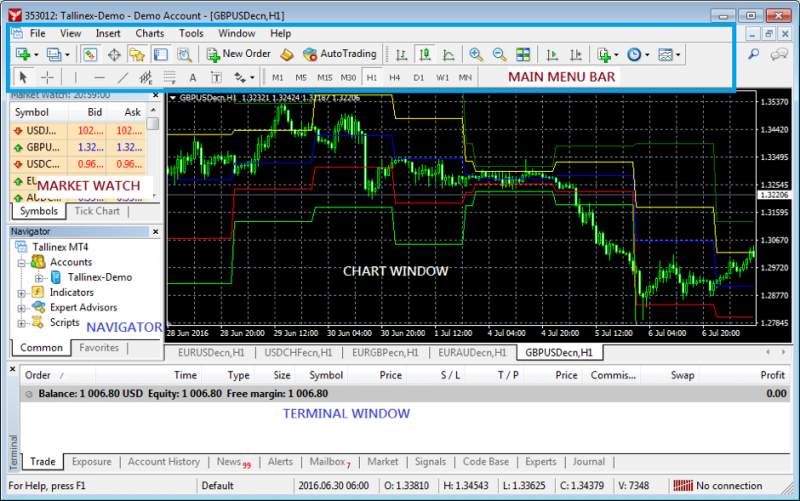 MetaTrader 4 (MT4) is one of the most popular platforms available today and is considered the industry standard. Even MT5, the latest MetaTrader release, has thus far been unable to surpass the popularity of its predecessor, although there are indications that this is beginning to change. MT4 is primarily a Forex trading platform, developed by Metaquotes. The platform can be downloaded and used directly, or more frequently, is licensed out to online brokers who then make it available to their customers. The software in its standard form is compatible with the Windows OS, however some of the online brokers provide a customised version of MT4 which is capable of running on iOS systems. MT4 is often used for margin trading, allowing users to have leveraged exposure to Forex markets. It also caters for automatic order execution with computer programs written in the MQL4 language, which is proprietary to MT4. The platform provides a good degree of flexibility for the creation of indicators and use of tools, allowing the user experience to be tailored to the needs of the individual trader. Multiple languages – Due to the widespread popularity of MT4, the platform is in many different countries. Hence the platform is now available in multiple languages, which makes it more accessible for non-english speakers. Charts – The platform provides excellent visualisation of market data through different types of charts, which can be selected by traders based on their preference. Expert Advisors – MT4 provides for robot-based, algorithmic trading through Expert Advisors (EAs). These tools can execute trades on behalf of users and can be configured based on user preferences. They can be very useful for either new traders who may need the help of computer programs to execute strategies, or traders with limited time available to devise their own strategies. Customisable – The MT4 platform lets brokers and users customise the platform to incorporate their required tools, markets and indicators. Communication – MT4 provides a direct chat link between the trader and broker, giving the trader access to convenient support. cTrader is a Forex trading platform developed by the award winning fintech provider, Spotware Systems Ltd. The platform is specifically suited to be used with ECN (Electronic Communication Network) brokers and since its launch it has been adopted by multiple ECN brokers including Australia based market leaders, Pepperstone. cTrader provides two key functionalities to users – 1) Order execution 2) Charting. The user interface of the platform is attractive, neat and easy to use. The screens are easy to navigate and intuitively designed which gives cTrader an edge over more complicated platforms. Charts – cTrader offers three chart modes – single-chart, multi-chart and free-chart which can be used to get different visualisations of market trends, based on user preferences. Market depth functionalities – cTrader provides a comprehensive assessment of market depth with three distinct views– Standard depth, Price depth, and VWAP depth. These features help the trader in closely tracking market liquidity for different price points, thereby helping them make more precise entries. cAlgo (cBots) – In line with MT4’s Expert Advisors, cTrader offers its algorithmic trading tool called cAlgo, which allows the trader to program robots for trade execution, creation of customer indicators, performing strategies and back testing. The tool works on C# language and .NET framework. Indicators and Timeframes – The platform offers a large array of indicators such as Moving averages, MACD, Bollinger etc. for analysis of market data. cTrader offers many timeframe options including the usual 1 / 5 / 15 minutes and more. How do the two platforms compare on some of the key criteria for evaluating a trading platform? User Interface: cTrader is known for its smooth, uncluttered and intuitive interface. Though the popularity of MT4 is certainly unmatchable, when it comes to the user interface and ease of use, the cTrader platform would potentially come out on top. This will, of course, however, depend on the trader. Novice traders are likely to prefer the ease of use that comes with cTrader. Support for Auto-Trading Functionalities: MT4 offers Expert Advisors for auto-trading, which are easy to use, customisable and work well for both new traders and experts. cAlgo is cTrader’s equivalent and is programmable in C#. MT4 is still, however, widely considered to have the best in class support functionalities for its auto-trading tools. Also as MT4 has such a vast online community, it’s easier for the user to find support on internet for this platform, whereas support for cTrader’s auto-trading may be limited. Market Depth Functionality: Understanding market depth is important for the trader as it enables them to access liquidity and enter trades at precise price points. cTrader offers three alternatives for market depth assessment which are standard depth, price depth, and VWAP depth. However, MT4 offers only one market depth feature. When it comes to giving the trader a comprehensive picture of market depth, cTrader scores above MT4. Flexibility and Customisation: The flexibility for customisation of indicators based on the personal preferences of traders is lower in cTrader. This platform does not allow users to customise indicators and programs, however MT4 has many tools that allow the platform to be fully customised, with or without the need to know the programming language. Both trading platforms certainly have their own strengths. MT4 is popular for its simplicity, flexibility, inbuilt tools and Expert Advisors. However, the strength of cTrader lies in its excellent user interface, sophisticated functionalities like market depth and multiple indicators and timeframes it offers. cTrader is easy to adopt for beginners and a user who has become accustomed to the user-friendly cTrader interface might not be willing to switch platforms at a later date, unless they require additional functionality that cTrader is unable to provide. Hence in terms of overall user experience, cTrader provides fierce competition for the market leader, MT4. Disclaimer: Some of the links in this article may use affiliate links, meaning that we receive a commission if you setup an account with a broker after visiting them through our link. These commissions help to cover the costs of running this website, and do not add any extra cost to you (in some cases, it provides you with better rates), as our commission is covered by the broker.